Truly, I'm not a conspiracy theorist. I like things to make sense and am skeptical of claims until I check them out. (Do you sense the "but" coming?) BUT, there's something seriously wrong with a system that is as out of whack as we have rolling out across the country for teacher evaluations. If Ohio were the only state completely taking leave of their senses, I wouldn't think so much of it, but it's many states. Almost makes you think there Someone or Something behind all of this. The most recent craziness that is causing me to reflect is this business of using student test scores to evaluate teachers. In Ohio, we have value added measures for teachers of reading and math grades 4-8. I have already addressed the errors of this methodology in a previous blog. After passing a law that required all teachers to be evaluated using student growth measures, it finally sank in to legislators that over half of our teachers don't have these magical numbers. Obviously, we can't leave something as important as evaluating teachers in the hands of principals and observations, and so another law was passed creating what we now know as Student Learning Objectives (SLOs). Naive as I am, I thought these measures would be learning objectives for students. Ha! Silly me! Instead, the SLO process is a lengthy document detailing a process of collecting baseline data, setting targets for where we want students to be by April, and then measuring and tracking to find the number of students who met the targets we set for them. Beautiful plan. Nothing wrong with professionals providing evidence of their impact on student learning, collecting data, setting goals. In fact, that is valuable work. So where's the problem? The reality is that we don't have the assessments to use for such a process. Teachers create assessments to use for their own classrooms, but there is no such thing as assessments to use for measuring growth for the vast majority of classes we teach. So, step one, we need to create common assessments that can be used for every teacher across multiple classrooms. Of course this is complicated by the fact that teachers are not trained to develop tests that measure growth. And the fact that testing companies that do this for a living need about three years to create such an assessment. And the fact that, even after creation, these tests need to be piloted and examined to ascertain that they are reliable and valid. Another consideration is that perhaps some things aren't meant to be quantified. This same process is being used for preschool teachers. What am I measuring, why and how for a three-year-old? How about physical education? I don't know about you, but I want kids to be MOVING in that class and not tied to paper and pencil tests. And if we base teacher evaluation on movement - how much control over student growth in fitness does an elementary teacher have when he/she sees the students 35 minutes per week and the rest of the time they're sitting on a couch eating potato chips? I'm seriously going to tie that teacher's evaluation on fitness goals??? Have you considered art? I can just see us rating Pablo Picasso as not achieving growth on the art rubric because he doesn't conform to traditional views. Isn't art about creativity? The next glitch in the system is that we have to take these tests - which are not created - and set growth targets. Since the tests don't even exist yet, we have no way of knowing what "ambitious yet attainable" goals might look like. None. How do I know what is a reasonable score for students by April on a test that has never been administered? And so we are setting growth targets for students that we are basically pulling out of a hat. Not a huge problem except that these arbitrarily set goals are going to be used as 50% of a teacher's evaluation. The tests are given in April so that growth measures can be computed and entered into a state database prior to the May 1 evaluation due date established in law. That means that the tests will not reflect the learning of the last quarter of the year and that teachers can't use the assessments as an end-of-course exam. 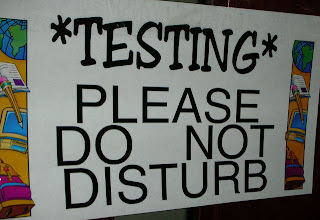 How will we get students - already weary of multiple days of testing on statewide assessments - to take these tests seriously and do their best? Maybe some of the best teachers are great motivators and can manage it, but to base half of a teacher's evaluation on something this nebulous doesn't seem to be advisable....or fair. Another crazy fact is this: the state and the national consortia are creating end-of-course exams for high school courses that will be ready in 2014-15. 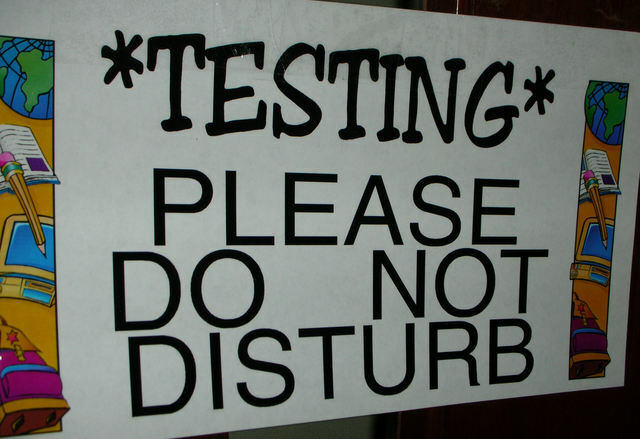 Tests will be administered in Algebra I, Algebra II, Geometry, English 9, 10, and 11, Physical Science, Biology, American History and American Government. Teachers of these subjects are spending an enormous amount of time training for SLOs, creating assessments, analyzing data, setting targets and doing a LOT of paperwork for assessments that will be used for two years. That's it. Two years. They won't really have the data to create good SLOs for at least 2 years and by then, they will be subject to statewide assessments that will flow into the value added measures used for teacher evaluation. Why have teachers go through all of this work to create random assessments with questionable targets for two years? Beats me. Nothing about this procedure makes sense. The timeline is extremely rushed for one thing - as I mentioned it takes testing companies three years to develop and test assessments and teachers are being expected to do it in three months - and the timeline makes no sense. We are switching to a new curriculum effective 14-15. FIRST we should teach the curriculum and train teachers in how to develop assessments designed for student growth. Next, after a 3 year process of teaching and testing, we can establish trend data and set good learning targets. And finally, if that system proves to be valid and reliable, THEN we can talk about whether it is an effective way to measure teacher effectiveness. Which it isn't. Educators, we have a problem. But it's not the one the media is trumpeting. We are being subjected to an unfair, inequitable, unreasonable evaluation system that will surely be litigated. As it should be. My job is to support teachers do the work to improve teaching and learning and I think there are elements in this process that can be helpful. I love facilitating educators from across multiple districts as they work together to prepare common assessments. Collecting data and setting goals is the right work. BUT (there's that word again), there is no educational, moral, reasonable way this process should be used as part of a teacher evaluation system. Ever.